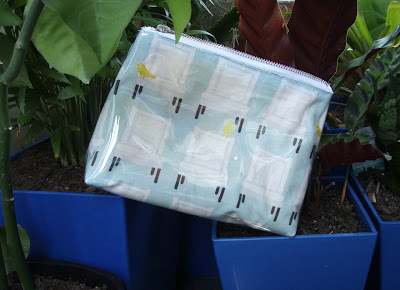 I bought this pattern here from Nicole M Design for Zip Purses. 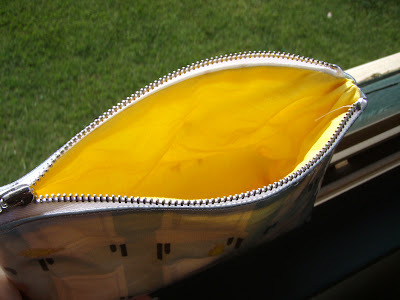 It is a simple pattern, and very easy to make and comes with 4 perfect sized zips. I tried it for the first time last night and must have been feeling a little bit cocky coz i decised to try it with a layer of plastic. I apologise for the bag pictures but as usual was excited and took some quick photos before i headed off to work this mornibng, so i could post about it today when things were quite at work. 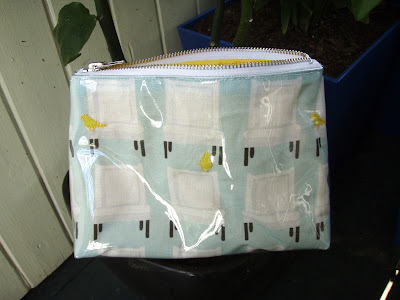 First i took my Birdies on Chairs fabric by Laurie Wisbrun, my first purchase from Spoonflower, i then did a simple stitch around the birds, to make them stand out a bit more, then i built this purse. It has a yellow interior to match the yellow birdies. The only issues that i had was to do with the plastic, it is a BUGGER, first of all once one piece touches another piece it sticks, so you can't move it very easily, like when you are squaring off the corners, to get them in the right position. Then when i was trying to sew it, my foot stuck to it, (sewing machine foot) i solved this by just placing a small bit of fabric underneath my zipper foot to let it slide nice and smooth across the plastic. Then coz of the plastic i couldn't iron it when it was done. mmmmm anyone have tips for sewing with plastic? But overall for my first try i am happy with my little purse, it now holds my digital camera and its cords, i plan to make more so if you want one let me know! Thanks Nicole for another great pattern! I have also bought this Dress Bag Pattern from her too, because it contained a lesson on making a zip closure at the top, look at all the different styles i can make. Stay tuned! Gosh you are so clever - I like the idea of the plastic. The bg looks great. Hey I forget you were a graphic designer too - so may come back to you on the blog thing when I have worked out what I want. I really like simple things! Wowee - that's fantastic! And what a brave girl you are for going with the plastic. It is a nightmare to work with - for all the reasons you mentioned. A teflon sewing machine foot helps, as does a bit of tissue paper here and there.... but it's riddled with issues. Most of all is the ironing problem. Love the purse - especially how you embellished the bird! I usually starch the fabric really well first, and iron on the non plastic side using a cool iron for a few seconds to smooth it out. I haven't had the plastic melt on me yet! Damn good post. And I liked the photos and the description. No wonder, you are a graphic designer, and have a lot of ideas to roll out. So cute!!! I can't believe how adorable that is. 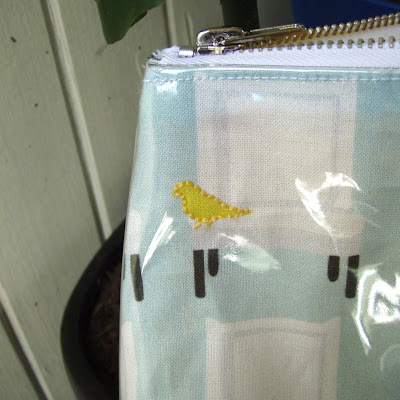 I'm so glad you liked sewing with my Birdies fabric. Can't wait to see what else you make! I'll post pics of your adorable little purse on my blog with my next update!